The former senior director of BRAC’s disaster management and climate change (DMCC) and water sanitation and hygiene (WASH) programmes, Dr Babar Kabir, died on 15 January 2015. Under his leadership more than 37 million people in Bangladesh were provided with hygienic sanitation and another two million with access to safe water through the BRAC WASH Programme. IRC has been a knowledge partner of BRAC WASH since 2006. Thanks to Dr. Kabir, BRAC supported IRC’s contributions to Sanitation Updates from 2012-2015. In 2013, Dr. Kabir gave this short video interview about the BRAC WASH programme for WaterCouchTV. Dr. Babar Kabir, a giant. We are bereft with the news of his passing and in awe of his immense contributions to WASH and our community. Babar Kabir is survived by his wife and two daughters. For more information read the obituaries on the websites of BRAC and IRC. 28 May is Menstrual Hygiene Day. In Bangladesh, BRAC field staff are working hard to “end the hesitation around menstruation” especially in schools. Field staff of BRAC WASH in Bangladesh talk just as easily about menstrual hygiene as they do about water seals for toilets or hand pumps. At community level menstrual hygiene messages are included in the programme for adolescent girls and young women. Since 2006 about 45 million community cluster meetings have been organised. At the 14th World Toilet Summit 2015, BRAC received the “Hall of Fame Award” for significant contributions to the sanitation sector in Bangladesh. On 20 January, BRAC received the “Hall of Fame Award” for significant contributions to the sanitation sector in Bangladesh. 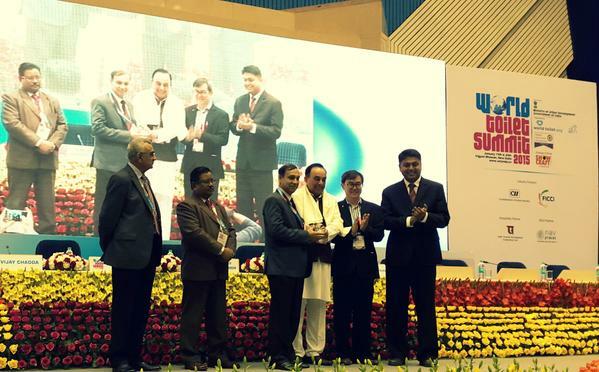 The award was handed to Dr. Akramul Islam at the 14th World Toilet Summit 2015 in Delhi by Dr. Subramanian Swamy MP, Former Minister of India, and Jack Sim Founder of the World Toilet Organization in the presence of Minister Devendra Chaudhry, Special Secretary, Ministry of Power India. Bangladesh has made remarkable progress in providing basic sanitation services to its people. It is now estimated that throughout Bangladesh, 57% use sanitary latrines, while a mere 3% of the people still practise open defecation. Over 8 years, the BRAC WASH programme reached more than 66 million people, about half of the rural population of Bangladesh. It has successfully worked to improve household sanitation by creating demand for hygienic latrines while supporting an extensive supply chain and local businesses. Current coverage with hygienic and adequately maintained toilets is 82% in the 152 districts where BRAC has worked. All these successes have been underpinned by a strong provision of service to the poor and ultra-poor and by a unique hygiene promotion programme focusing on universal use and sustainability of services in communities, households and schools. IRC is a knowledge partner of BRAC WASH since 2005. BRAC plans to expand its scope beyond WASH to water security and from rural to urban areas, as well as moving from service provider to facilitator. The BRAC WASH Programme is rebranding. For 2016-2020 it will be renamed as the BRAC Environmental WASH Programme. This reflects the planned gradual expansion in scope beyond WASH towards water security and from rural areas towards low income small towns, urban areas and coastal areas. Specific areas of intervention include solid waste management at scale, faecal sludge management, water security and quality, enhanced secondary school programmes and alternative sanitation technologies at scale. There will be a gradual shift in operating styles from direct service to facilitation, advocacy and joint implementation, learning and monitoring the impact of programmes. Operational partners will include Government at all levels, civil society, the private sector and other NGOs already operating in the same regions. Planning and budgeting will need to be flexible and adapted to specific regional needs, requiring on-going investment in staff and partners capacities. The strategy builds on ten years of experience in large-scale rural WASH programming. Ongoing support to the rural population will continue and be enhanced, for example, dealing with the well-known challenge of sanitation in difficult hydrogeological settings, and will be integrated into other local BRAC programmes. Staffing will be reduced where earlier programmes have achieved their objectives and appear sustainable within existing institutional structures. In terms of its financing, a mix is envisaged of grants, joint implementation of programmes with government and multi-lateral institutions and business models that apply market solutions to large scale change. Cost sharing and user payment in some activities will remain a feature of the programme. Direct BRAC support is being applied to programme development and piloting, for example, alternative water services in the coastal region. Read the draft version of Strategy 2016 – 2020 BRAC Environmental WASH programme : everyone, everywhere, all the time. See also IRC’s webpage on the BRAC WASH Programme. In Bangladesh the standard number of toilets in schools has been set as a minimum of one toilet for every 60 students. However, this is far from being achieved. The infographic below shows that on average, schools in Bangladesh have half the number of toilets required. However, although 94 per cent of schools have latrines within the compound, a large number remain unusable because they are dirty or broken. Bangladesh has made tremendous progress in the fields of health and sanitation. With a population of 149 million, it now has the highest life expectancy; the lowest fertility rate and the lowest mortality rate of children under five in South Asia (excepting Sri Lanka), although it spends less on health care than most neighbouring countries. Only 10% of the population in Bangladesh practices Open Defecation (OD) compared to 50% in India. It is one of only six countries that are on track to achieve Millennium Development Goals 4 and 5 on reducing child mortality and improving maternal health. Emerging from the war of liberation in 1971, Bangladesh embraced a new more liberal identity, which manifested itself in a change in societal attitudes towards women, and girls’ education in particular.